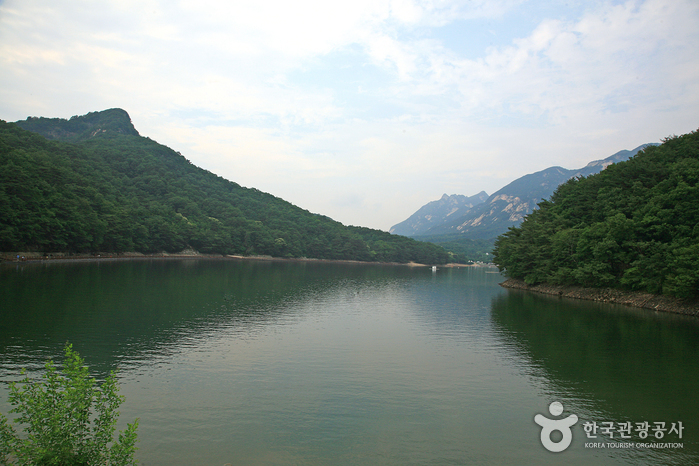 Sanjeonghosu Lake is one of the main attractions in Pocheon and is situated down in the valley between Myeongseongsan Mountain, Mangbongsan Mountain, and Mangmubong Peak. Meaning “lake as clear as a mountain well,” Sanjeonghosu Lake was built as a reservoir to supply water to farmlands in 1925. Thanks to its surrounding attractions, the lake brings many visitors each year. Promenades along the lake are popular for couples as well as tourists who stay in the nearby hotels. Beautiful fog often rises from the lake in spring and fall, making boating at night quite picturesque. Hikers frequent Myeongseongsan in spring and fall. Visitors love skating on the lake in winter. The lake is also surrounded by an amusement park, swimming pools, sledding facilities, and spa amenities, attracting many family visitors. Local restaurants are renowned for their delicious, wholesome food made using freshwater snails and mushrooms. Other local favorites include maeuntang (spicy fish stew), dotorimuk (acorn jelly), sanchae baekban (Korean set menu with seasoned wild vegetables), and deodeok gui (grilled bonnet bellflower roots).